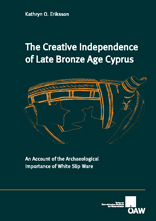 This volume attempts to present a comprehensive account of the historical developments in Cyprus during the period of the production of White Slip Wares (ca 1580–1180 BC). Using the Kitchen chronology for the Egyptian New Kingdom, which commenced in 1540 BC, the study emphasizes the importance of archaeological records and how context analysis allows more precision in a relative chronology. This period witnessed the emergence of Cyprus into the political and economic interaction of the East Mediterranean. With special focus on White Slip pottery, the historical events outlined herein demonstrate the growth of Cyprus into a vibrant, independent society from the early 16th century BC into the 12th century BC. Throughout this period, Cyprus developed trade, cultural as well as "diplomatic" relations with the most powerful kingdoms of the surrounding area. A focal point of the study is the role of Cypriot wares – especially White Slip, Base-ring and Red Lustrous Wheel-made – on the island itself as well as in other places. A major role is given to White Slip as it is considered a chronological beacon in the analysis of events during the Late Bronze Age, a time when there are few historical references to the island and its people. Comprising eight chapters, this comprehensive analysis of Cyprus's material culture is accompanied by a historical account in which the period in Cyprus from 1580–1180 BC is divided into seven chronological periods based on Åström's original chronology. The comprehensive historical discussion in Chapter VII seeks to depict the interactions between Cyprus and the surrounding cultures during this period. The interpretation of the evidence shows that the island's leaders were skilful in achieving a balance between the interests of these various civilizations, which included the Minoan and Mycenaean from the Aegean, the Canaanite groups, the Hittite Empire, and of course the Egyptians. The evidence shows that independent Late Bronze Age Cyprus established extensive trade and diplomatic links with these societies – notwithstanding the various conflicts among them. The Cypriots managed this within the complex and changing interrelationships between the empires during these very turbulent times. In so doing, Late Bronze Age Cyprus managed to develop the creative skills of its people – this especially reflected in the wide range of its ceramic wares (such as White Slip) as well as their extensive production and distribution to many lands.